Graphical mapping; whether it be Mind mapping or flow charting, are excellent communications formats. 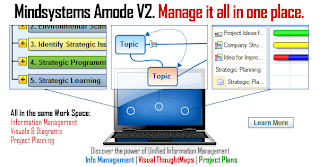 However when you crack open Amode, you’ll be offered a feature rich end-to-end information management product. Multiple modes of information expressed within a flexible workspace, enabling you to create with clarity manage effectively and exchange with ease. The Amode software unlocks the true power source behind flexible information management. Gone are the days of restrictive graphical formats, the new Mindsystems Amode ThoughtPad will enable you to make your point in almost any visual format that will support your knowledge database in a logical and structured way. Amode is a complete information management solution that shall take you from concept to successful completion of any project or task. Visit Mindsystems now and grab your own copy of Amode V2.